So many of us are used to eating Italian, Indian, Mexican, & French based meals with a few favorites from other areas thrown in that this creamy, winey dish scented with cumin and clove, studded with raisins and almonds, and accented with a touch of lime dances across the palate with a refreshing note. Although this bears little resemblance to the true Caribbean Chicken Souse, there are a few notes, here and there, that have been borrowed for this very loose interpretation. Someday, maybe, I’ll post my version of that famous hangover soup; in the meantime, if you’re from the Caribbean, forgive the name – that’s how this recipe came to me years ago, and I just assumed it was named for the wine in here! 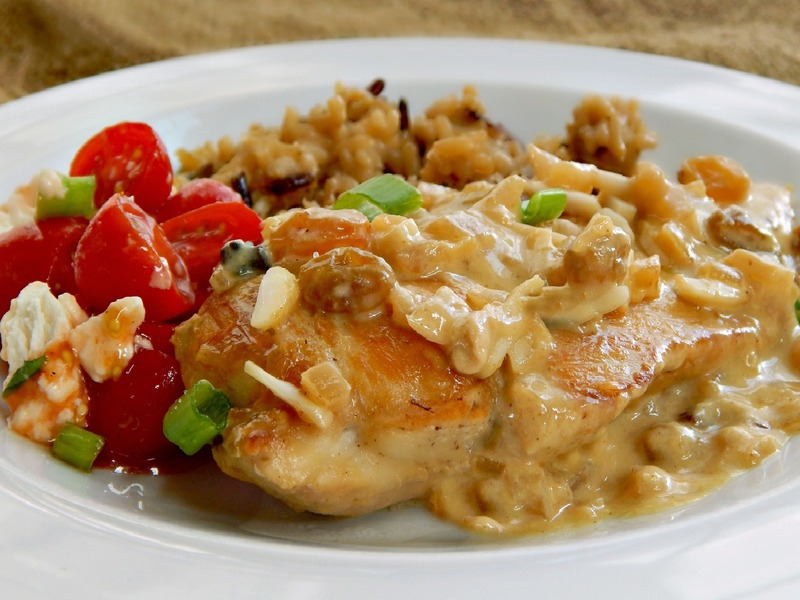 Chicken breasts are easy, fast & affordable, but watch the sale prices and stock up at the low. You’ll find several good sales and at least one great one per quarter so it pays to track & know which is which. Half & half and wine are always at great sale prices around almost any holiday. Raisins and nuts are almost always at a low during the winter holidays, so stock up then. If you make a recipe, like My Mother’s Chocolate Cake, that uses egg whites, this recipe is a great way to use a couple of the yolks. Heat one tablespoon of olive oil & the tablespoon of butter in a large skillet. Add chicken breasts and saute three to four minutes until golden brown. Turn and add onion to pan (with additional tablespoon of olive oil as needed) and cook a few minutes longer until the chicken breasts are nicely browned on the other side. Remove the breasts and add one cup of the wine, the bay leaf, cloves and cumin. Simmer about 10 minutes until onion is tender and wine is reduced by a little more than half. Add chicken stock, raisins and the chicken along with any remaining juices. Cover loosely with the lid, turn down to maintain a light simmer and cook until chicken is just done, around 15 minutes or so, depending on the size of the breasts. In a small bowl, mix the 1/2 and 1/2, the remaining wine and two egg yolks. Add to the skillet and cook until desired thickness is reached, stirring, but do not boil. This entry was posted in Click here for Bargain Meals, Click here for Fabulous Food Posts and tagged Alcohol, Bargain Meal of the Week, Chicken, Chicken Breast, Chicken Stock, Dried Fruit, egg yolks, Green Onion, Half & Half, Nuts and Seeds, Raisins, Wine. Bookmark the permalink. How interesting! I would love to give this a try. You are right a little wine and cream and the dish is instantly fancy! Frau, that looks delicious. really delicious. How do you find the time to post so often and with such quality? Thanks, Conor – and the posting is funny because I’m always trying to make and try new things and it seems like so many aren’t “blog worthy.” Then I don’t have a post!! Okay… I know there is so much amount of wine here, but it is possible to replace with something very close? This dish looks really good, Mollie! Juhls. use broth, instead & maybe a teaspoon or two of vinegar to brighten it up! That’s kind of my go to if I dont want to use wine. I lived in Trinidad/W.I. and yes, this chicken is delicious!!!! !